Cobbler Round Up: Blizzards and Drips, oh my! The blizzard obviously topped all topics this week, creating a three day week and leaving students and staff with a plethora of stories to tell. You can read a number of stories from the Blizzard here at the Pine Needle. The football team didn’t play Sioux Falls O’Gorman last Friday night, or on Saturday, or early in the week, as a number of rescheduling attempts failed. Instead, the team resumed practice on Wednesday, in the Civic Center parking lot (hopefully without tackling), to prepare for their trip to Sioux Falls Washington. The remaining schedule has been juggled quite a bit, and now the game against Stevens has been moved to October 18th (7pm) and the game against O’Gorman has been moved to October 24th (6:30–when the Stevens game was). Between the injuries, the early releases, and the blizzard, it seems the Cobblers’ biggest opponents this year have been outside obstacles . . . Speaking of rescheduling, next Friday’s volleyball match against Mitchell has been bumped up, with the varsity playing at 5pm instead of 7pm. Drip. Drip. Drip. That’s the soundtrack of our lives right now, with more than 100 areas or spots where water is leaking through the ceiling. Mr. Talley has pointed out that this does not mean the roof is leaking in more than a hundred spots, but it still is a bit discouraging (if you see a custodian, smile!). Mitigating factors include the snow that hasn’t entirely melted and the hail damage from this summer. 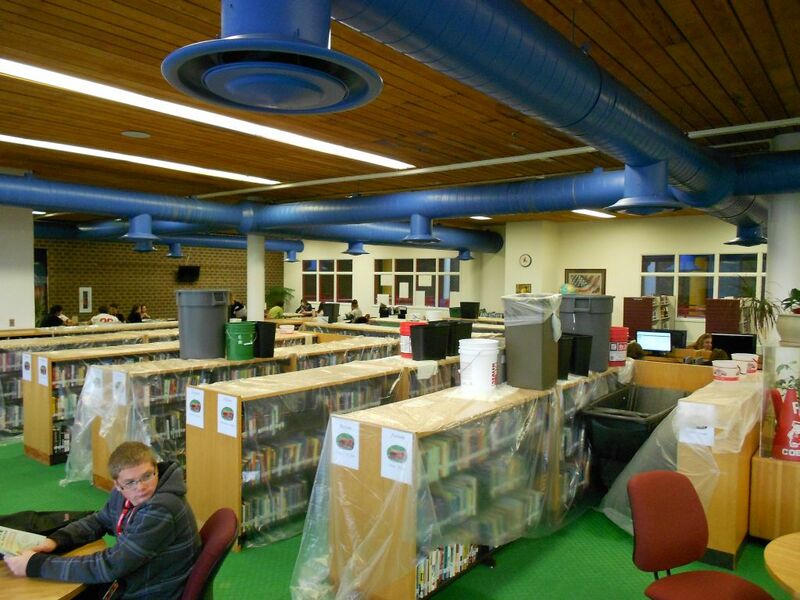 Until then, everyone is placing trashcans in strategic places, and Mrs. Mertes is trying her darndest to save the library’s collection of books!